An update of this post. An example of it in action is below. 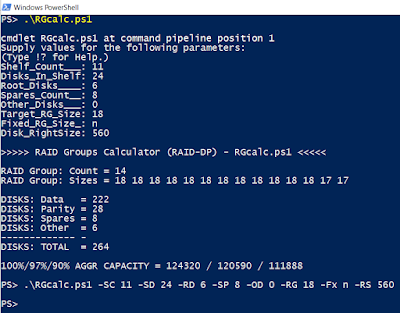 It’s very simple to run, just run as .\RGcalc.ps1 the first time and it will tell you the command line syntax if you want to re-run and make minor changes. 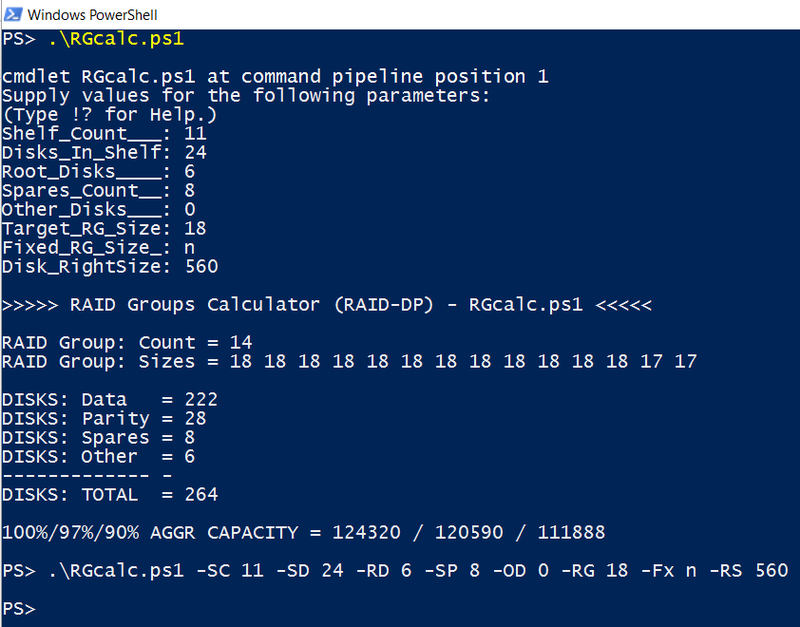 ">>>>> RAID Groups Calculator (RAID-DP) - RGcalc.ps1 <<<<<";""
"RAID Group: Sizes = " + [String]$Output;""
"DISKS: TOTAL = " + [String]($Shelf_Count___ * $Disks_In_Shelf);""
"100%/97%/90% AGGR CAPACITY = " + [String]$AggrCap + " / " + [String]([Int]($AggrCap*0.97)) + " / " + [String]([Int]($AggrCap*0.90));""
"PS> .\RGcalc.ps1 -SC $Shelf_Count___ -SD $Disks_In_Shelf -RD $Root_Disks____ -SP $Spares_Count__ -OD $Other_Disks___ -RG $Target_RG_Size -Fx $Fixed_RG_Size_ -RS $Disk_RightSize";""